Recently, we had author Jerry Burton visit us here in Cambridge, MA. 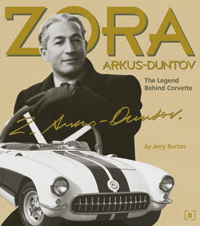 Besides writing the award-winning biography of Zora Arkus-Duntov, Jerry is also executive editor of Corvette Quarterly magazine. We took the opportunity to tape a chat with him about the recent history of General Motors and his perspective on where GM is headed today.